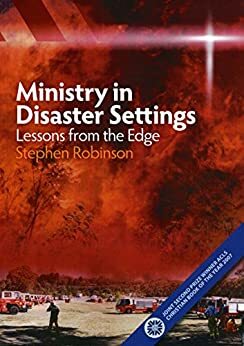 Ministry in Disaster Settings: Lessons from the Edge studies the issues for clergy and church leaders during disasters. It is based on interviews with a number of ministry agents who cared for their communities during and after major tragedies. The book seeks to understand what were the issues for them, including how they were affected, if and how they were cared for, and what lessons the church can learn in doing this work and caring for the carers. this is a valuable resource to all people involved in ministry, chaplaincy and caring for pastors and other religious helpers. Part One is a series of Case Studies of individual ministers and chaplains involved in: The Granville Train Disaster; The Kempsey Bus Crash; The Port Arthur Massacre and the Thredbo Ski Resort Landslide. Part Two examines the nature of ministry "on the edge" and its affect on ministry agents. Part Three is Biblical and Theological Reflections on Ministry in Crisis times. Part Four consists of lessons for ministry on the edge; for pastors and their carers. Ministry in Disaster Settings is a "must read" for anyone contemplating ministry in emergency services. While giving hope as to what can be achieved in bringing comfort and support in the lives of those effected, it also provides a sombre look at the cost of emergency services ministry. This serves the carer well, and makes sure that they set up the appropriate support networks for themselves, so that their ministry does not destroy them, and become martyrdom. The book is compelling, sobering, and takes the reader on a journey through the trauma and tears of emergency ministry.